Free Neon License Plate Frame. Bring style to your license plate with a Free Neon License plate Frame! 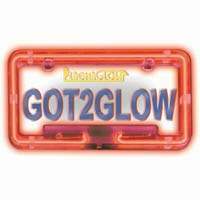 Plasmaglows Neon license plate frame will add a custom look to any vehicle! They fit any U.S.A. style license plates, and can be mounted three different ways for a custom look! Our license plate frames are complete with a built-in transformer to allow for a simple 2-wire hookup! The license plate frames are 100% waterproof and sealed in a high-impact tubing for guaranteed durability! All license plate frames come in 8 brilliant colors. All necessary instructions and hardware are included to ensure a smooth installation and are backed up by the Plasmaglow Warranty. If you are a professional looking for the highest quality Neon license plate frame, look no further than Plasmaglows neon frame.